Table Quiz Helper: What happens at a table quiz? What happens at a table quiz? 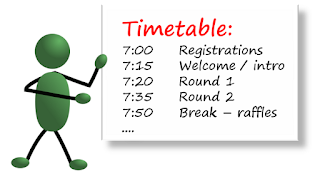 Every table-quiz is different - some quizzes have a few rounds with lots of questions, others have lots of short rounds, some have special rounds or other activities in-between rounds. You arrive. Maybe you came wwith a table of friends, or you may need to meet other people who are looking for a team member. Registration: You are assigned to a table, your entrance fee is collected and you are given a set of answer sheets. You choose a name for your team - it's a good idea to write this on all the answer sheets now, so you don't forget later on. There is a chance to mix-and-mingle with the other participants, and perhaps have some refreshments. The quiz starts: The MC welcomes everyone, gives any last minute announcements, and explains the rules. The quiz-master reads out each question in round 1, followed by a pause for you to discuss it with your team and write the answer down. At the end of round 1, your answer sheets are collected and, in the background, people start marking your answers. The quiz-master reads out each question in round 2. At the end of round 2, your answer sheets are collected. 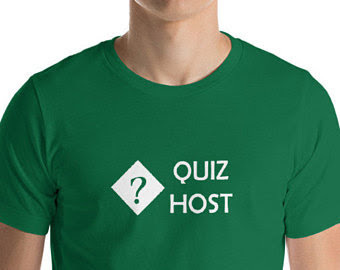 In the gap between rounds 2 and 3, the quiz-master will probably read out the answers to the round 1 questions, and the everyone's marks are written up onto a scoreboard. This pattern, of "questions - more questions - answers - scores" usually continues until half-way through the evening, when there is a refreshments break. At the break, there may be food, drinks, time to go for a cigarette. And if the purpose of the quiz is fund-raising, there may also be a raffle. After the break, questions - more questions - answers - scores continues until the last round is over. The raffle is drawn and prizes are given out, or perhaps there will be some entertainment. In the background, the markers are marking the answers to the last round, adding up all the scores, and working out which table has the highest score. If more than one team has the winning score, there may be a tie-breaker round. The final results are announced. Prizes or certificates are given out. There is a short speech, thanking the sponsors, and people who contributed to make the event a success. At this point, you are free to leave - although sometimes people stay to socialize.